This spring one of the pieces I wanted to add to my wardrobe was a baby blue sweater. So...when I walked into Forever 21 in search of one and saw a baby blue sweater right in the front of the store, I knew it was fate! And for only $20 I knew that I most definitely had to have it! For this outfit I wanted to wear a very springy, light outfit so I decided to pair it with my white jeans. Then, I added cobalt blue accessories and wore my flats from Target that I am absolutely in love with!! The perfect blue outfit in my opinion! Gorgeous outfit! I love you clutch! I love all of these shades of blue together! I am dying for a pair of shoes like that, but I can't find the right ones yet. Yours are so cute!! I love the color paring you did with this outfit! Great look! Always gotta love F21!! Perfect blue sweater--which seems to be the IT color of the season! You look fabulous and I love how you paired it with the colbalt shoes! those colors on you look so lovely! love the pointed flats! 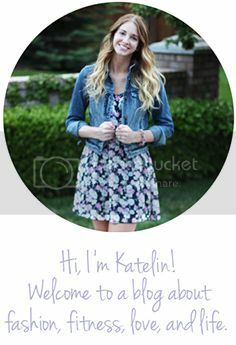 You are absolutely radiant, Katelin! The different hues of blue paired with the white pants is perfection! I now have added a baby blue sweater to my MUST buy list! Thank you for the inspiration! The color combo here is AMAZING! Blue and c white are a match made in color heaven as it is but mixing shades of blue is pure genius. Lovely outfit lady!